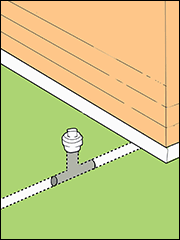 How Do I Unclog a Main Drain? First, find the right drain opening to reach the clog. A main drain cleanout could be your best choice, since it's usually easiest to feed the drain cleaner uphill through the cleanout, toward a problem area under the building, or downhill toward a problem area in the yard. 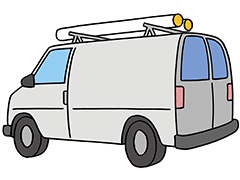 The main drain cleanout is often located outside, around two feet from the building foundation, in a line that runs from your building to the city drain or septic tank. If the building has a basement, the cleanout could be there. 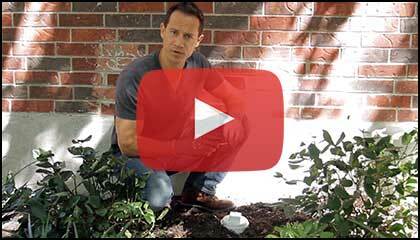 Outdoor cleanouts can sometimes be hidden by shrubs, or buried by soil that was added after construction. Newer homes could have additional cleanouts on exterior and interior walls. These secondary cleanouts can be a good choice if they feed downhill toward the problem area. If you can't locate the main drain cleanout or can't use it to reach the problem area, you can try to feed the drain cleaner through an indoor drain opening like the opening under a sink, a clean out opening in a wall, or a shower floor drain. Next, choose the right drain cleaner. Consider using a sewer jetter to clean a main drain, since it can help scrub off sticky residue on pipe walls and flush away sediment so fewer clogs come back. A Needle Nose™ drain cleaner is a sewer jetter with a tougher, braided steel jacket and a special compact nozzle tip that allows it to pass through more types and sizes of drains. Put on fluid resistant work gloves and eye protection. Use extra care if you believe the pipe could contain drain cleaning chemicals. 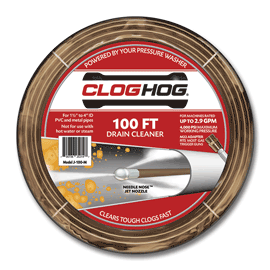 Connect the drain cleaner to your pressure washer trigger gun, start the pressure washer, and then guide the nozzle at least a foot into the drain opening, taking care to feed the nozzle in the direction of the clog, before you start the flow of water. Guide the sewer jetter into the pipe as you squeeze the trigger. For more thorough cleaning, every few feet pull back about halfway and then continue moving forward. If you're feeding the sewer jetter uphill, listen for a surge of fluid as the clog clears, and then move a foot or two back from the drain opening to avoid any splashing liquid. 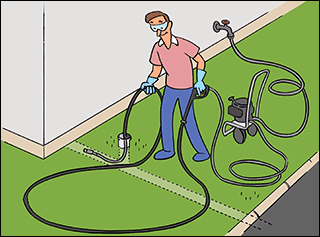 After you have finished cleaning the drain, pull the sewer jetter out. 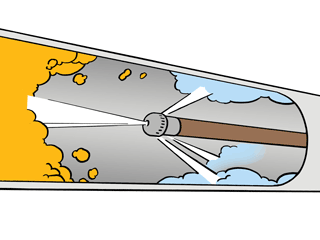 Use care to release the trigger to stop the flow of water before the nozzle reaches the drain opening. Then replace the drain cover. For more details you can watch this 3 minute video. 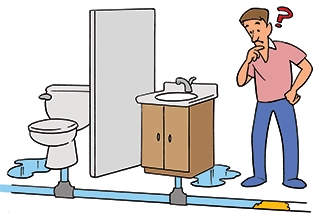 If you think that your sewer drain could have structural problems, or if your property has foundation issues or there are symptoms such as sticking doors and cracking walls, you should hire a licensed plumber to inspect the drain so you'll be sure that a drain cleaner won't get stuck in any large crack or breach in the line. If you think that the clog could be caused by tree roots, and you're sure that the drain is in good physical condition, consider renting a large mechanical drum auger with a root cutting blade to clear the line. If you live in an older home that could have ceramic (clay) or Orangeburg (wood composite) drains, you should hire a licensed plumber to inspect the drain before cleaning since these types of drains are more likely to clog because of cracks, breaches and structural issues.